Here at Hog Master, we have been selling and loaning our machines out for many years now and it is a great feeling when we make a sale knowing we have made the customer very happy and that they can enjoy a beautiful hog roast. During the summer is one of the best time for us because we usually sell hundreds of machines due to the fact is it really hot and everyone wants an amazing hog roast or barbeque. With our machines you can do both which is very handy indeed, simply swapping the hog roasting tray with the BBQ surface and hey presto you know have a BBQ. Our machines are very efficient and work in perfect harmony with the hog and other foods being roasted. With our many accessories you can simply swap over the parts and change the way you roast your food and change the experience you give to those who are watching. Our Hog Master machines are used all over the UK; to people’s gardens, to 5 star restaurants. We sometimes have sold more than one to the same person. We have sold some of our glorious machines abroad to places like Austria, Poland, and Saudi Arabia. We have a healthy relationship with a reliable courier service that is quick and efficient. 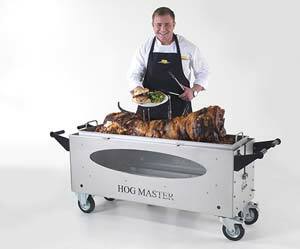 We feel our Hog Master machine is perfect for anyone who wants a good old hog roast. Many who have tried our hire service have been that impressed they have gone onto buy one or even two. 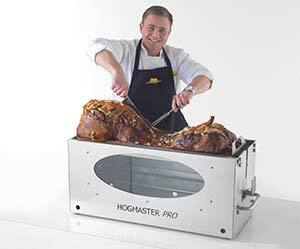 We feel our Hog roast machines cannot be beaten we are looking into new accessories. Since we know looking for the right hog roast machine can be hard plus since most things are buy online now days it is hard to see the product as well as get a feel, having this knowledge we invite you to look at our machines in our factory being built. You can watch it from start to finish which we feel is amazing to watch since we are mad about hog roasting plus you get to see what you machine actually is. We also have a showroom where our sales team can talk to you all about hog roasting and hog roast machines, they can help you with any questions or queries you may have. You may want to ask about starting you own business and we are more than happy to lead you in the right direction.